Description: A westbound NS mixed freight comes downgrade and the signals for CP MO are lit for an approaching Amtrak eastbound. Description: I waited all day for this train and drove over 200 miles from home to catch it. NS 980 pulls the NC Transportation Museum's E8 6900 and three Caterpillar loads. ISO 1250, 1/200th of a second, F5....ya gotta do what ya gotta do. It was nearly dark. Description: Returning to the North Carolina Transportation Museum in Spencer, NC. Description: A nice look at the side of this ex-BN unit. Description: EOT Dead Head Rack Inside. Description: Lease engine working a Yard job. Description: NS Westbound Freight Train 187 ( Macon, Ga. to Birmingham, Al. ) easing to a stop at Edwardsville, Al. for a meet with a few trains before proceeding on west to Birmingham, Al. Description: NS Westbound Freight Train 187 ( Macon, Ga. to Birmingham, Al. ) passing through Bremen, Ga. Description: An ex-BNer helps NS train 346 Northward. 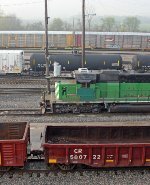 Description: NS #9253 And CEFX #7108 in Charleston WV. Description: NS 130 (2nd unit) / 32nd St. Description: NS Northbound Freight Train 130 ( New Orleans, La. to Chattanooga, Tn. ) passing through 56th Street in Woodlawn, Al.